So is this the final shopping list? Anything else? UDSM or JDM ecu? Last edited by 1BADGT4 on Mon Oct 08, 2007 11:25 pm, edited 1 time in total. so did anyone buy from onlinecomponents with their min order of $30? That means that you have a bunch of extras in hand. Let me know if you do and I will buy the needed parts from you. PM me as im really interested on how my car would work with the st185 ecu that the engine is originally designed to work on. EDIT. Also for the pins, can anyone confirm the right part number for the 173631-? and 173716-? id really like to get a 185 ecu in my car also. im pretty desprate to have it done. someone is going to make some cash! 97 dodge 1/2 ton lifted and beaten to death daily. ok guys, i am ready to purchase the necessary connectors from onlinecomponents. Anyone with me in purchasing these to get to their minimum order of $30? You can paypal me half of it and I will ship you your set free of charge when it gets here. How about it? Well, I wired up my 185 ecu to my 165 harness and it started up in -10deg. celcius! I have to wire the IC pump constant and then take it for a test drive tomorrow. Here's a pic of the adapter harness i made so I didnt have to hard wire everything up in -20 to -35 deg. Celcius weather. Also it allowed me to switch back to my 165 ecu if it didnt work. You didn't by any chance document the changes you made to the pin-outs, did you? Hi, i'm cedric from perth, australia. I ve got a st165 jdm with a st185 jdm engine. but was still running with the st165 ecu and loom. I needed to swap to the st185 ecu because 1987 st165 jdm doesn't have fuel cut based on pressure from the PIM. It's measured with the air flow. So i cannot boost more than 10 psi. Could you tell me how did you do to plug FC and OX2 ? Could it be because there s nothing plugged in PIM? 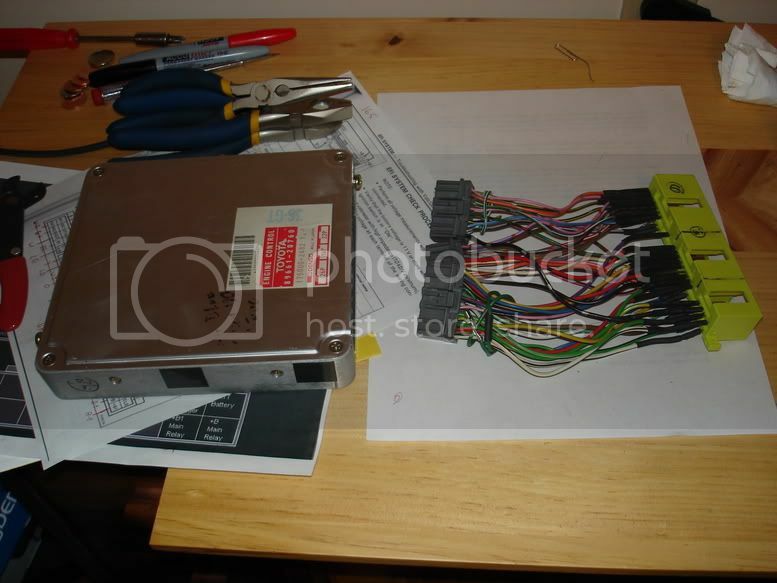 I have made an Excel Spreadsheet that converts the ECU side of the harness and the Engine side of the harness from the 1st Gen 3SGTE to the 2nd Gen and provides wire colour-to-wire colour equivilants. I've been working on it for a year now, and have been fortunate to have a Toyota dealership's resources at my disposal. I am unsure of how to post it, so if anyone wants a copy, shoot me an email and I'll fire it off to you promptly. I am most of the way done my harness adapter, but wanted to check with other who have already succuessfully completed this to make sure I'm on the right track. I have used the female plug from a 162 ecu that wasn't every going to see the light of day again, and picked up the male plugs from Dany. I moved the required pins (finally realized after about 30 minutes of trying to work the first pin free that there's a release on the plug...) and am well on my way to making a much less visually appealing version of the picture above. Here's my question: This adapter is to get the engine to run on it's own computer, utilizing the 165 harness already run throughout the car right? Will the 165 harness, already attached to the lights, doors, etc. continue to work those items? I guess what it mentally tripping me up is the idea that the 185 has a seperate harness for the inside of the car. Also, I have been using the online BGB from CelicaTech for the 185...does anyone know if the pin-outs are different for the jdm 185 than the usdm 185? I have just ordered 3 sets of pins/couplers from onlinecomponents to meet 35 bucks. I will eventually do 3 of these and will offer them to members here on the forum. gpmarzan wrote: I have just ordered 3 sets of pins/couplers from onlinecomponents to meet 35 bucks. I will eventually do 3 of these and will offer them to members here on the forum. cool im in for one. the male plugs are part #'s 174514-6 (16 pin), 174515-6 (22 pin), and 174516-6 (26 pin), with contacts being part #'s 173631 (large) and 173716 (small). you'll need 16 of the larger and 48 of the smaller ones. I shouldve done my research some more. The female receptacle part # listed above is for an st185. I received my order today and playing around with it, i was able to hook up the female recept with the male plugs which I automatically said "damnit." I think the part # for the st165 female recept is 172319-7.